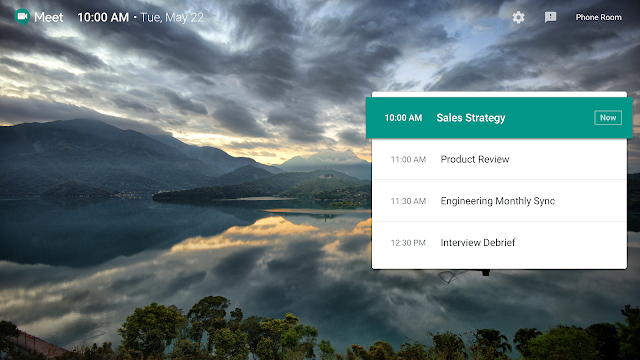 Just like when using the remote control, the agenda for the room will now be shown on the in-room display, even when a Hangouts Meet touchscreen is plugged in. This confirms to users what meeting they’re about to join, as well as previews what’s to come in that room. We’ve also moved some features, such as the clock and Meet logo, to the top of the screen for all room TV displays. The Hangouts Meet home screen shown on the TV display when the Hangouts Meet touchscreen is plugged in. With this launch, we’re also adding a new Meet screensaver. When your Chromebox or Chromebase for Meetings, or Hangouts Meet Hardware device goes idle for an extended period, we’ll display a screensaver with the Meet logo. Finally, in Hangouts Meet, you can now display custom wallpapers on in-room TV displays instead of the default Meet images. After uploading the images in the Admin console for the appropriate organizational unit (OU), these wallpapers will be shown on the associated Chromebox or Chromebase for Meetings, or Hangouts Meet Hardware devices, regardless of whether the devices are using classic Hangouts or Hangouts Meet. More information on these settings and where to update them can be found in the Help Center. When joining a meeting, having the right context is important. That’s why we’ve added some new features to the Hangouts Meet TV display, such as a more informative home screen, screensaver, and custom wallpapers, to quickly orient users.